PowerTap Power Meter Type: Strain gauge units with pedal, chainring and hub mounted meters. Years in Business: PowerTap was founded in 1998. U.S. Service Center: Yes. Wisconsin. Overview/History: Founded in 1998, PowerTap was one of the very first power meter companies. PowerTap became one of the largest players in the power meter market by creating a wide range of hub based power meters at prices below what competitors like SRM offered. A little mor e history – the PowerTap hub design was invented in the 1990’s in Cambridge, MA by a company called Tune (not related to the other “Tune” in the bike industry). Tune figured out how to place strain gauges into a hub shell to measure power at a price that was lower than the only other option available at the time – the crank mounted SRM developed in Germany. Tune had issues with water penetration in their design and the issues created everything from faulty readings to failure. Tune never fully solved the issue and was on the brink of totally going under when Saris purchased them in 2001. As Saris did with CycleOps trainers, they took a company who had a really good idea, but who was having trouble executing the details, and breathed new life into them after acquisition. 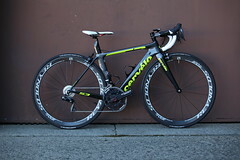 While the changes did not occur overnight, Saris infused much needed money into developing out the PowerTap line and reliability started improving. They also made the expensive, but smart, move to continue to support and service original Tune PowerTap units and this built real credibility in Saris as a company and showed their dedication to optimizing the design. Today, we are happy to report that current PowerTap product is one of the most relia ble in the power meter business and their service and two year warranty on many products remains at the top as well. Strain gauge technology in a proven design based upon compatibility with Look Keo cleats. Easy to switch between multiple bikes and requires no special tools or a torque wrench. 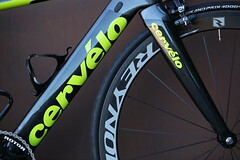 U.S. Service Center supported by a strong, diverse and experienced power meter company. ANT+ compatibility means you can use any ANT+ head from Garmin, PowerTap, SRM or others and Bluetooth Smart means compatibility with units from Polar and Suunto. User replaceable standard AAA batteries – 60 hour estimated battery life – are readily available and provide a very weather tight battery seal. Works with virtually any frameset and crank. Available in lower priced single sided option that can be upgraded to dual sided in the future. “Keo Style” cleat system only. 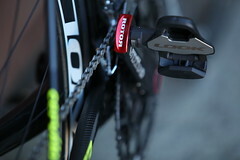 While the PowerTap Pedal uses its own cleat, it interfaces with a Look Keo cleat well (albeit not perfect) too. Does not currently offer “Pedaling Dynamics” functions like the Garmin Vector. Reliability/Maintenance: While the PowerTap Pedal is a new product in 2015, PowerTap is a very experienced power meter company. We would be surprised if long-term issues of significance show up. The PowerTap Pedal is powered by a well protected and well sealed AAA battery with an expected life of around 60 hours. The batteries need periodic replacement, which is easy to do by just removing a threaded cap with an Allen wrench. Compatibility/Limitations: Will work with most any bike or crankset that will accept a standard set of pedals. Turn clearance is reduced ~2 degrees compared to a Look Keo, but still provides ample clearance for lean above 30 degrees. Display Quality/Features: Most ANT+ cycling computer head (Garmin, PowerTap Joule…) or Bluetooth Smart head (Polar, Suunto) may be used with the PowerTap Pedal. Weight: PowerTap Pedals are a little over 400 grams, making them 125-175 grams heavier than many of the most common pedals on the market that lack a power meter. L/R Power Balance: Yes. The pricier P1 pedals included left/right power while the lower priced P1 option is just a single sided unit that may be upgraded to dual in the future. Ease of Installation & Transfer Between Bikes: Excellent. PowerTap Pedals are very simple to install and transfer between bikes. Basically, just install them firmly as you would with any other pedal system, set up your computer head and you are ready to calibrate and ride. Software/Hardware: Updating firmware on the PowerTap C1 is done through a wireless Bluetooth app, which has become almost standard fare for power meters now and a great way to do it. The training software package from PowerTap is not the strongest. It works though and provides basic data, but most people prefer aftermarket software like TrainingPeaks. Hardware durability on the current generation product is vastly improved, but be careful with old stock or used product as a finicky older PowerTap can require trips to the factory for repair. Conclusions: The PowerTap P1 is priced around $1200 for the dual sided version and $700 for the single sided version for 2017, PowerTap’s Pedal mounted power meter offers a ton of performance, versatility and simplicity for the money from a company with a long track record with strong and proven support. If you are good with the Keo style cleat design the PowerTap P1 Pedal uses, it should likely be on your short list. Contact Us for more information or to order PowerTap Pedals. Priced around $700 at release (fall 2015), the PowerTap Chainring offers a low price from a proven power meter brand. Reliability of PowerTap product has been strong since 2009. Relatively easy installation – much like installing regular chainrings. One of, if not the, lowest priced dual sided power meter available from an established power meter company. Exceptional battery life (200 hour claimed) with user replaceable batteries. You must use a crankset that works with standard 5 bolt/110mm spacing. Not available in all gearing options and not compatible with current Shimano or Campagnolo cranks. Bye-Bye 34 tooth inner ring. Reliability/Maintenance: While the PowerTap Chainring is a new product in 2015, PowerTap is a very experienced power meter company. We would be surprised if long-term issues of significance show up. 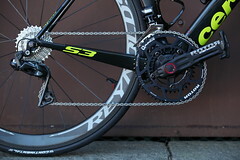 The PowerTap Chainring is powered by a common CR2032 battery. PowerTap claims 200 hours of use per battery and the battery is easily user serviceable. Compatibility/Limitations: The PowerTap Chainring will work with most any crankset that uses a 5 bolt 110mm compact bolt pattern. This means it will not work with current generation Campagnolo or Shimano cranksets or any crank that uses 130 or 135mm BCD. Gearing will initially be available in 50/36, 52/36 and 53/39 combinations. There is not a 34 tooth inner option due to size restrictions. Display Quality/Features: Most ANT+ cycling computer head (Garmin, PowerTap Joule…) or Bluetooth Smart head (Polar, Suunto) may be used with the PowerTap Chainring. Weight: PowerTap Chainrings are about 150 grams heavier than standard chainrings from FSA. Ease of Installation and Transfer Between Bikes: PowerTap Chainrings install much like any other chainring set. Basically, just install them firmly as you would with any other chainring, set up your computer head, and you are ready to calibrate and ride. Likewise, switching the PowerTap C1 chainrings between bikes is of the same complexity as any other crank or chainring change between bikes. Conclusions: Crank compatibility will be an issue for a good number of riders. However, initially priced around $700 in 2015, PowerTap’s Chainring mounted power meter should offer a valid power meter from a proven and respected company that has been making power meters since 1998. 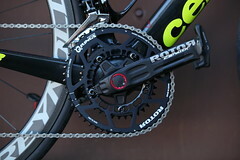 Contact Us for more information or to order PowerTap Chainrings. PowerTap G3 hubs offer a wide range of price points using PowerTap’s proven strain gauge technology. Easy to switch between multiple bikes (assuming they share the same axle). Measures from the closest point of power application to the road of any power meter. If the bike uses a standard wheel axle, a PowerTap hub will likely work. While there is a wide range of options now, not all wheels are available with PowerTap as an option. The more wheels you want to use, the more the price goes up as you have to keep adding PowerTap hubs to each pair. Early generation models could be finicky. G3 units are well sorted. Changing frame axle standards could complicate compatibility with some current and future frames. Your next bike may use a different axle than your current. Reliability/Maintenance: The current generation of PowerTap hubs rivals SRM for reliability, which has had the best long-term reliability record in the business. The PowerTap hub is powered by small calculator style 357 SR44 batteries. The batteries need periodic replacement, which is easy to do if you have the tool to remove the plastic cap. Otherwise, there really is no other specific maintenance outside of normal hub bearing service. Compatibility/Limitations: Available in versions with Shimano/SRAM or Campagnolo hubs in road and mountain configurations, there are not any known limitations or compatibility issues with readily available frames/bikes. If you can install a standard wheel in the bike, you can likely install a PowerTap equipped wheel. PowerTap has factory built wheels with a number of different level rims as well as stand-alone hubs that we can build into the rim of your choice. Display Quality/Features: Any ANT+ Sport cycling computer head (Garmin…) may be used with the current generation of wireless PowerTap and many of the older original wireless versions can usually be upgraded with a ANT+ conversion firmware update for about $100 (if you can track one down still). PowerTap also offers their own Joule series of ANT+ computer heads that are a nice upgrade from the standard yellow Electro head that had been in use since PowerTap’s early days. Weight: PowerTap hub/wheel systems can vary widely in weight. The first level of PowerTap wireless hub, the Pro hub on its own weighs 446 grams while the G3C with ceramic bearings and all the latest technology is substantially lighter at 315 grams for the hub. The increase in weight to add one to your bike will depend on your current hubs, but will normally be from a scant 70 up to a more notable 200 grams. L/R Power Balance: No. The G3 is hub mounted and thus detects the power in as close a place to where it is applied to the road as possible (the wheel), which means it does not detect left/right leg balance. Ease of Installation and Transfer Between Bikes: Wireless PowerTap hub/wheel installation is about as simple as it gets. All you really need to do to install a PowerTap G3 hub is install the wheel in your bike and mount the computer mount on the handlebar. As with all the power meters, you need to setup the data fields in the computer of your choice and enter your personal information and activate power meter functions – this will be the most time consuming part of the install in most cases. Of course, zeroing out most any power meter is a good idea for the most accurate data, although current firmware is making this less and less important. When it comes to transferring the PowerTap G3 power meter between bikes, it is quite easy (as easy as changing a wheel). However, it does require that your bikes share the same dropouts. Conclusions: PowerTap’s hub mounted power meter units have the consideration of limiting wheels options, but they are proven and one of the easiest to switch between bikes (assuming compatible dropouts/axles) and provide power measurement at the closest transfer point to the ground of any unit. PowerTap is also a very good company when it comes to supporting their product.